Spring cleaning is right around the corner, and before you know it, we’ll be cleaning every inch of this house. Before you do that, I challenge you to ditch those toxic products and give my favorite natural cleaner a try. It’s official. Spring is coming, and that means it’s time to deep clean every inch of my home. Does anyone else feel like they need to deep clean when the seasons change? It can’t be just me, right? I’ve become sort of a clean freak as I’ve grown, and having a house that smells good is really important. A year ago, I found a natural cleaner that I wanted to use on everything. Not only did it smell amazing, but it boasted about using essential oils and natural ingredients right on the label. The ads were super cute and showed the bottles in sparkling clean kitchens, and every blogger in the blogosphere was writing about them. I had to have it. I mean, it’s natural and the package is pretty! 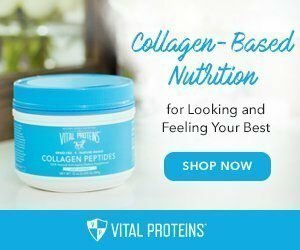 All the health bloggers are blogging about it! So, I bought it all, and it became my favorite. And then, I realized something heartbreaking. I’d become a victim of greenwashing. I should have seen it coming, but I was drawn in with the beautiful ads and the catchy marketing. Unfortunately, when I decided to put this cleaner into my Think Dirty app, it came back at a 9 out of a 10. I was upset, but thought surely it was just that one scent. So, I went to the store and started scanning all the products. They were all natural cleaners and used essential oils! Surely it was a fluke, right? I couldn’t find a single product that rated less than a 4. That’s better, but not up to my personal standards, so I had to stop using it completely. I decided to do some digging, because we all know that while those apps are helpful, they’re not 100% reliable. Maybe it’s the fact that they use the term “fragrance” in their ingredients, when I know they’re using oils. Except…on further digging, it says right on their site that they do in fact use artificial fragrance. You know, a blanket statement approved by the FDA to hide all sorts of ingredients known to cause headaches, skin irritation, allergies, asthma, an increased risk of cancer, and damage to the central nervous system. (I talk more about this here). Why do I insist on natural cleaners? We had to cut a lot of products from our home to keep my oldest daughter healthy as a baby. Because of that, I’ve become a really good label reader. Now that I know that these can chemicals do, and I don’t want them anywhere near my home. I don’t want to put these chemicals in a plug-in and breathe them in, giving them direct access to the limbic system of my brain. I don’t want to wash my clothes in them, letting them sit directly on my skin all day long. Why would I wash my dishes and my food prep surfaces with chemicals labeled “not safe for human consumption,” and then turn around and serve my food on those same surfaces later that same day? I wanted something cleaner. Something that could make my house smell good, clean to my standards, and contain no harsh chemicals. Was I searching for something that didn’t exist?? I was starting to think so. Then, I found Thieves Household Cleaner. I’d had my Young Living Starter Kit for a couple of years already, but hadn’t honestly done much with it besides buy my oils. 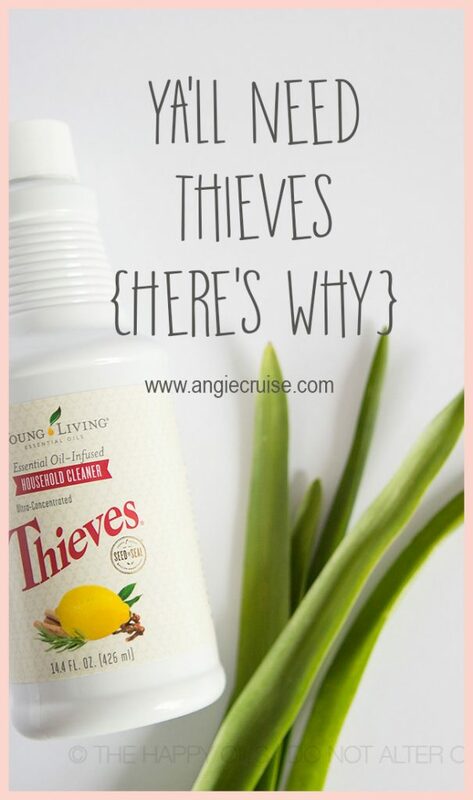 When I told a friend how frustrated I was trying to find a natural cleaner that I actually liked, she told me to try the Thieves Cleaner. I was tired of smelling vinegar in my kitchen every day, and wanted a natural cleaner that would actually make my house smell good. 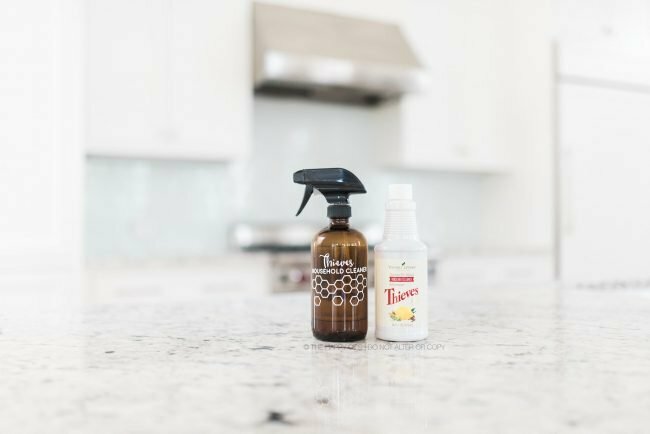 I gave Thieves Household Cleaner a try, and fell absolutely in love. Now, I can’t help but shout it from the rooftops! It makes my house smell like Christmas when I use it alone, but it also blends so well with so many oils to really make it your own. If I get some on my skin while cleaning, it’s no big deal. There are so many recipes you can make with it, since it’s a concentrate. I shared some here. Are you getting ready to spring clean? 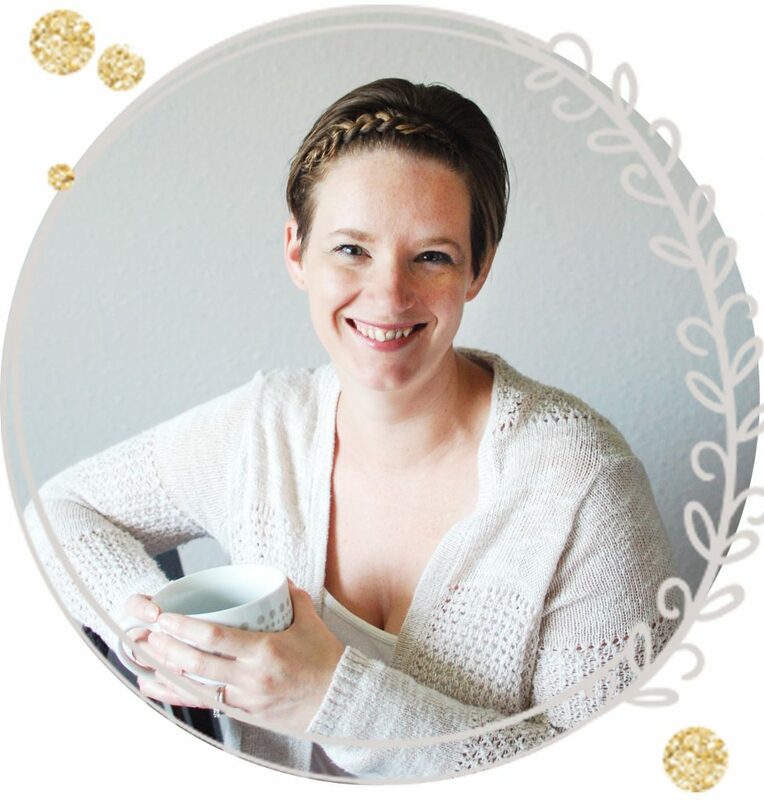 A group of us natural minded mamas are currently gearing up for our own spring cleaning sprees soon, and put together a group to share our favorite natural cleaning recipes using Thieves cleaner, organizational tips, and tips on how to manage your day so you don’t feel behind. If you’re already on my Young Living team, this group is already open to you. Just request an invite! If you’re not on board yet, no worries! Just grab a bottle of Thieves cleaner by the first week of March and we’ll get you added so you can learn in time for spring cleaning! (If you’d like to order, you can contact me here). What household cleaner are you currently using? If it’s something you can buy in a store, I’d love to challenge you to check it out on Think Dirty! 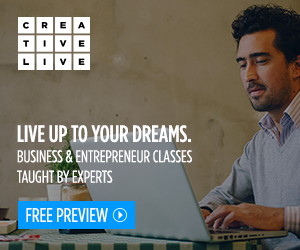 Are the results something you can live with? If they’re not, I’d really love to talk to you about my favorite natural cleaner so you can get your hands on some, too! 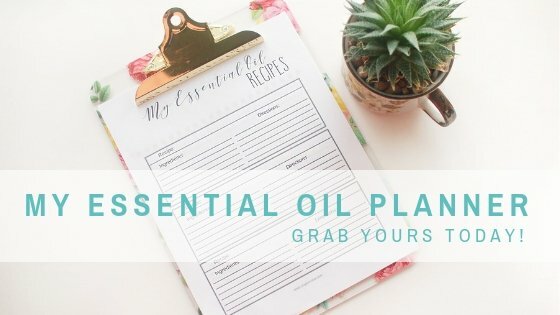 Organize Your Essential Oil Cleaners and Recipes!